Three groups of students in the Barbados Interdisciplinary Tropical Studies program complete projects related to a big, and potentially deadly, pest - the Giant African Snail. Originating in East Africa, this creature has quickly established vast colonies in South America, Sub Saharan Africa, South and South East Asia, and has been present in other West Indian islands since the 1980s. Its fast-growing and widespread colonies consume vast amounts of food crops, gardens and natural resources, leaving behind only a gluey, sticky trail and ravaged fields. It's also a potential danger to human health. Lurking through warm, moist ecosystems of the tropics is a slow-moving, ravenous and glutinous giant. Originating in East Africa, this creature has quickly established vast colonies in South America, Sub Saharan Africa, South and South East Asia, and has been present in other West Indian islands since the 1980s. To survive, its fast-growing and widespread populations consume vast amounts of food crops, gardens and natural resources, leaving behind only a gluey, sticky trail and ravaged fields. This giant creature, otherwise known as the Giant African Snail, has not only been a detested pest due to its ability to devastate garden crops, but is also a potential danger to human health. As part of the Barbados Interdisciplinary Tropical Studies (BITS) Program, a bilateral offering between McGill University and the University of the West Indies, students undertake a project course of national importance in Barbados. Guided by McGill and UWI professors, as well as various local mentors, three groups of students from the class of 2011 completed very interesting projects related to the Giant African Snail. With the support they needed to complete their projects, these undergraduate students were able to engage in the meaningful research detailed in the sections below. As mentioned earlier, the Giant African Snail is not only hated due its ability to ravage crops, but has also been known to be the intermediate host for a parasitic nematode: Angiostrongylus cantonensis. This nematode causes a disease in rats known as rat lung worm. When ingested by humans, this same organism can cause Eosinophilic meningitis. In humans, this condition causes inflammation of the meninges which can lead to mental retardation, nerve damage, permanent brain damage and death. 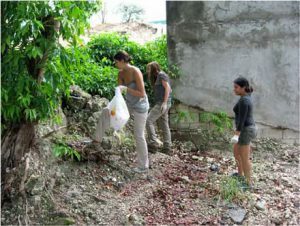 Although this nematode has been detected in snails inhabiting Brazil and many other countries where the Giant African Snail is found, a team of McGill students under the supervision of Dr.
From left to right: team members Dominique Murray, Sarah Cascarino and Neha Paliwal collecting snails for sampling. Angela Fields, the mollusk specialist of the University of the West Indies and UWI BITS Director, undertook the study to determine if the Giant African Snails inhabiting the island of Barbados are carriers of this potentially lethal nematode. Neha Paliwal from Connecticut, Dominique Murray from Lakefield, Ontario and Sarah Cascarino from Philadelphia collaborated in this study entitled: The Giant African Snail and Barbados: Potential Health Effects and Efforts to Control Snail Population. When asked in an interview what the motives were for conducting this sort of study, they responded that a study of this scale had never been conducted in Barbados. However, since this disease is potentially dangerous, and the snails are extremely mobile, the potential for disease spread needed to be assessed. With the advice and encouragement of their mentors, these three student-researchers began their study by collecting 10-snail samples from 30 different sites spanning the entire island. Once the snails were collected, they were measured, weighed and euthanized so that their foot, where the nematode resides, could be severed for the next step of analysis. The foot was ground-up in dilute hydrochloric acid to soften the tissue in order for the nematodes to wriggle out for sedimentation into a funnel and collection. The funneled solution was then analyzed under a microscope for the presence of Angiostrongylus cantonensis. The team’s findings showed the presence of a nematode However, they are uncertain if it is the same strain of nematode that causes rat lung worm or Eosinophilic meningitis in humans. Nevertheless, snails from 14 of the 30 collection sites were seen to be harboring a nematode. 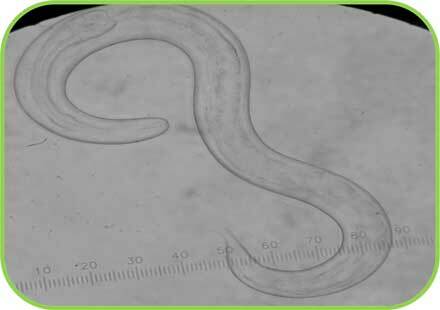 To confirm the true strain of nematode, these samples were sent to The Centre for Disease Control in Atlanta, United States. Molecular analysis is not available yet for definitive identification of this nematode. With the help of mentor Mr. Ian Gibbs, Head of the Entomology Division at the Ministry for Agriculture, the students were able to not only examine the snail on a microscopic level, but also on a social level. They conducted surveys in order to get a better grasp on Barbadian’s views of the current control measures such as the Bounty System, and their overall opinion of the snail. In short, Barbadians hate the Giant African Snail; this is in part due to their size (they could reach 20 cm in length!) and their potential to attract small predators, such as mice and rats. With regards to control behaviors, it was found that there is a distinct group of people who participate in the Bounty system regularly, which grants $ 0.50 to Barbadians per pound of Giant African Snail collected. The success of this form of control, however, is dependent on rates of community participation with the goal of collection being on par or higher than that of snail reproductive rates. Each survey respondent who had snails on their property were actively engaged in snail control of some other form, positively reducing snail populations. Putative rat lung nematode (still to be confirmed). The team concluded that they are confident that nematodes are present in the Giant African Snails dwelling in Barbados; however they warn that this does not mean that these findings are indicative of the presence of the exact strain of Angiostrongylus cantonensis that causes Eosinophilic meningitis. As for control measures, the young researchers proposed that the Ministry of Agriculture and Rural Development take measures to use current participants to target specific high-density areas in order to have a better control of snail populations. With the assistance of the McGill students, their mentor Dr. Angela Fields was able to conduct the first island-wide study in Barbados. The girls are hopeful that these findings will be used by health officials in Barbados, not only to protect the health of the population, but to ensure the continued flourishing of tourism. They are also confident that this project could be used as a baseline for university and government initiatives and be continued by McGill undergraduate students in the coming years. As a country of only 430 sq km and 37% arable land (CIA World Factbook, 2011), Barbados faces issues of limited crop production and food insecurity. Therefore, the introduction of such a detrimental pest as the Giant African Snail could greatly disturb the already fragile agricultural sector. In the many areas around the world that this snail calls home, many methods of eradication have been used to get rid of it. Some examples include the chemical use of metaldehyde, the physical removal of all snails (unfortunately, including the native ones), and biological controls such as introducing predators of the snail into the infested area. However, the majority of these methods may be detrimental to the environment or not very cost-effective (ISSG, 2010). To this end, students Tamara Provencher, an Engineering major; Anna Kalkanis-Ellis, a Biology major; and Martin Legault another Engineering major, came up with a cost-effective, simple and safe way to trap snails. With the help of their McGill and UWI supervisors and local mentors, they came up with an integrative sequence that starts with traps, but then processes the snails to be used for other purposes such as composting, as a component of animal feed (see ‘The Meat of the Problem” for more information), or prepares them for disposal. Initially the project was focused on the design of a trap, which would simply and efficiently capture the Giant African Snail. However, the well known disgusting odour of rotting snails inspired the design of a trap which would both capture and dehydrate the snails simultaneously, to avoid snails rotting inside the trap. 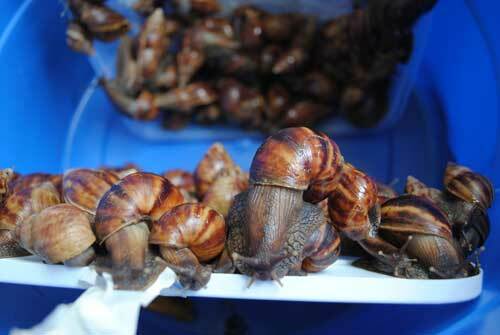 A manual crushing of the snails is also necessary in order to ensure proper dehydration of the snails. 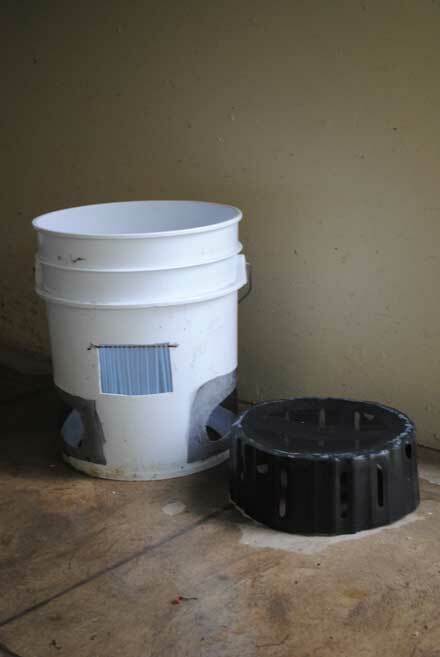 The final trap sequence consists of three mechanisms: an easy-to-build trap made of 5 gallon buckets that could be collected from a local fast-food restaurant, a hammer mill or hand-powered screw crusher, and a solar dehydrator built from plywood. The student’s clever trap sequence, once tested, was a success at trapping, crushing and dehydrating the snails. Once trapped, the snails have the potential to be used as a food for humans (escargot), as a component in animal feed (if fresh and alive), in fertilizer, or as compost. The potential for the use of the snails is not very much appreciated though and this resource is not currently being tapped to its full potential since Barbadians do not rate the snail very highly. Promoting a better image of the Giant African Snail as well as safe-handling measures could help change the current image of the snail in Barbados. The trapping portion of the snail trap. A trap prototype was donated to the Ministry for Agriculture so the students believe that their work is in the right hands. Kalkanis-Ellis, Provencher and Legault were very content with the work that they completed, especially since they were involved in the entire project, from the drawing board to its physical creation and these traps were certainly the first of their kind in Barbados. This was empowering for the students and the team felt that it gave them better skills in management, coordination and team building; skills which aren’t usually acquired in a classroom. Although the project served as an undergraduate project, the team feels that this type of work is not as recognized as say, PhD or Masters work. At these latter levels of education, there is a certain structure and legitimacy attributed to the work, whereas undergraduate work could be seen as less valid. However, the BITS program organizers and certainly the student project team participants recognize the importance of having undergraduates involved in research. Undergraduates bring originality and enthusiasm, and see things from a different perspective than others. Moreover, they believe that it would be beneficial for the undergraduates of the scientific community to have more such opportunities and a better mechanism to distribute or make widely available the results of their research here at McGill. As Nigerian poet Wole Soyinka once said: “The hand that dips into the bottom of the pot will eat the biggest snail.” Although this might not be a literal quote, the research team comprised of Anne Reglain, Margot Roux and Thomas Dashwood, took this quote to a whole new level. For their Barbados Interdisciplinary Tropical Studies project, this group of McGill students used the ever-invasive Giant African Snail as a component of broiler chicken feed to aid the poultry industry and contribute an effective pest management system. Currently, many snails are being disposed of through the Ministry of Agriculture’s Bounty System, in which they are purchased from the public at BDS $0.50/lb and then incinerated. However these captured snails were seen as a wasted resource that could easily be used in a more efficient way. At first, the plan was to use the snails to create a new dish that could be served to humans; better known as escargot. However, this idea was soon scrapped since Barbadians have a revulsion towards these big snails. Pigs were considered as a study group to experiment with but chickens have shorter life cycles and are a lot easier to raise than pigs. Also, broiler production in Barbados is one of the most important agricultural industries, with chicken accounting for 60% of the protein intake of the local population (Caribbean Poultry Association, 2002). This project, which was the first of its kind in Barbados, drew on some previous studies which showed that snail meat could be a good source of protein when incorporated into chicken meal. 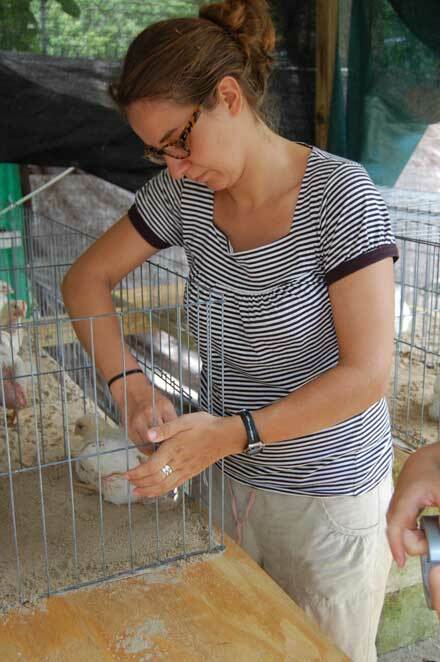 Anne Reglain tending to the chickens. In order to begin the experiment, the nutrient compositions of dried and ground up snail meal samples (snail meat with and without shells) were submitted for analysis to a McGill University laboratory. The meals were analyzed for crude protein, fat, ash, and mineral content. It was found that the protein content of the snails without a shell was a lot higher (71.6%) than those with their shells (19.32%), but that the latter provided a better source of minerals such as calcium and phosphorous. Although snail meal containing shell produced a lot more ash, which is a limiting factor to the amount of snail meal that can be added to the feed due to its high carbon content, removing the shell from the snail proved to be a time-consuming and potentially costly step. For this last reason, the students used snails with shell to create a basal broiler chicken feed. With this analysis step complete, the students and their mentors moved on to the real meat of the project: a donation of 30 baby broiler chicks was received from Chickmont Foods Ltd. These were divided into three groups, each receiving a feed treatment containing either 0% (control), 5% or 10% snail meal. Each bird’s consumption rate, growth rate and feed-to-weight conversion ratios were calculated and, once the 3-week growing period was over, their carcass weights were determined after slaughter at 47 days-of-age. The team found that each treatment was equally good at producing healthy, sizeable chickens under non-industrial conditions. There were no differences of weight across the treatments and every bird attained the commercial target weight of 2.11 kg/bird. The snail meal fed to the chickens did not affect the feather or offal weights of the birds either. Although this experiment was carefully constructed by the team and mentors, it was recommend that the experiments be repeated with a larger sample size per treatment, and include a greater % of snail meal, so that the results could be confirmed for publication and commercial use. An important component of the project is to determine how this type of chicken feed would be received by the public and how it could benefit Barbadians. The Ministry of Agriculture’s Bounty System accumulates approximately 150 tonnes of snail per annum (pers. com Ian Gibbs, 2011) and results from the experiment suggest that conversion of some of these snails into a snail meal feed resource is a possibility. Moreover, a cost analysis of snail meal without the shell conducted by Robert’s Manufacturing showed it to be worth approximately BDS $2,000/tonne, compared to soybean (BDS $1375.00/tonne) which is a common protein-providing component of chicken meal. Theoretically, it could replace the entire soybean meal component of broiler feed. The team believes that someday, the snail meal could be destined for export to other countries as a component of broiler feed or pet foods. 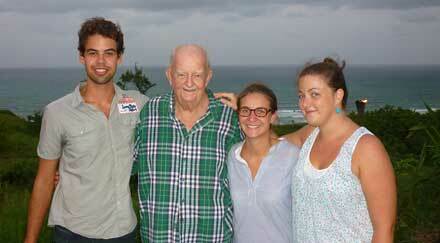 From left to right, team members Thomas Dashwood, Anne Reglain and Margot Roux pose with their mentor, Keith Laurie (second from left). However, there are obstacles to overcome in order to implement this plan. For one, the public does not rate the Giant African Snail very highly. They believe it to be an unhealthy, disgusting pest, and therefore feeding snail meal to their favourite dinner item and largest source of animal protein could mean the boycotting of certain companies that practice this method. Also, an efficient de-shelling procedure does not exist and therefore would have to be invented. The team and their mentors have suggested that a large-scale education program to educate the public about the snail and snail-fed chickens could be of great use to overcome their concerns and have suggested that whole snails and animal offal be processed at the local rendering plant and incorporated directly into feed. The much maligned and troublesome Giant African Snail is a potentially valuable resource with a number of potential uses that could be advantageous from economic, environmental and pest-management standpoints. With a little persuasion and some basic infrastructure, snails could provide a quality broiler chicken feed component, potentially replacing 10% (or more) of commercial feed. For the students that participated in this project, the experiment provided a valuable learning experience since they were involved in the entire creation of a project that was the first of its kind in Barbados. Without the BITS program, McGill’s Carribean campus, the Bellairs Research Station project site, and the generous project support funds from the Inter-American Institute for Collaboration on Agriculture (IICA-Canada) these projects would not have been possible. For these, and the generous mentorship of McGill and UWI staff, local government agencies, businesses, and individuals, the three teams of McGill students are very grateful. The resulting projects from the BITS program gleam with a success that could not have been achieved without this support, mentorship, and financial aid, and for this, its participants extend their warmest thank-yous. For more information on the Barbados Interdisciplinary Tropical Studies including how to take part in it,, visit www.mcgill.ca/bits/. Teri Baloukas graduated from McGill this spring with a BSc in Environment (Ecological Determinants of Health). She is currently working as an Associate Researcher in the Faculty of Agricultural and Environmental Sciences with professors Danielle Donnelly (Plant Science) and Stan Kubow (School of Dietetics and Human Nutrition). Teri wishes to thank Dr. Donnelly, who is also the Director of the BITS program, for her support and guidance during the writing of this article.